Photo: What dictates how much pain you feel after injury? A routine work day can quickly turn sour, as Michael, a mine manager, discovered in August. After securing a large boulder, he watched in dismay as one of the securing chains broke and 200kg of stone fell on his foot. After local care, he was transferred to a trauma centre for management. A four-hour operation aimed to salvage the foot by cleaning up dead tissue, pinning multiple fractures and then reconstructing a “flap” of muscle and skin from his upper leg to fit into the defect in his foot. In the immediate post-injury phase, trauma victims receive well-coordinated and intensive care. This involves teams of surgeons (trauma, orthopaedic, reconstructive), skilled nursing care and assorted specialist input tailored to their needs. I work in one such team, dealing with anaesthesia and pain management, that assists the transition from the emergency room, though surgery and into the rehabilitation phase. Numerous studies show that pain following trauma persists in many: one in four have moderate to severe pain 12 months following trauma, and up to one in three have significant pain and disability three years later. When examining factors associated with persistent pain, a number of indicators emerge. The severity of injury and degree of pain (and its control) consistently predict recovery. Poorly controlled pain in the first week following injury increases the risk of severe pain one year later by two to three times. Pain is more than just a sensation indicating tissue damage: it is a multidimensional experience. Numerous areas of the brain are activated. The threat of an injury activates a range of responses, not just from the brain but also behavioural. This includes signals from the brain that travel down the spinal cord and to the tissues to inhibit pain, allowing us to survive the initial threat and begin the process of recovery. Experiments involving pain have demonstrated this response, called central pain modulation, can have a significant influence on our experience and response to painful injury. After the severity of pain in the early phase, the next most important risk factors for persisting pain and disability are “psychosocial”. Education status, pre-injury anxiety, depression, perceived disability and whether the injury occurred in a compensation setting (such as TAC for road accidents in Victoria or WorkCover for accidents at work in most Australian states) have all been shown to affect how long pain persists. The brain’s ability to modulate pain has been shown to vary not only between individuals but also within an individual over time. This is partially based on the context of the painful experience. 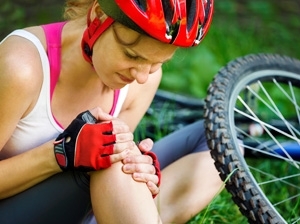 Those entitled to compensation for their injury have been found to be more likely to have persistent pain and disability. This means the attribution of blame for an injury becomes relevant. In Michael’s case, as manager and proprietor, he takes ultimate responsibility and, in any case, his injury was the result of mechanical failure. If an injury occurs as the result of negligence of an employer or is the fault of another driver, for example, the brain’s response is different and the risk of pain and disability in the years ahead is significantly higher (four to five times higher in some studies). Similarly, our brain’s ability to increase or decrease sensitivity to pain appears to be altered by our education status and psychological health, both in human experiments on pain and studies examining trauma recovery. Not finishing high school and reporting anxiety or depression both before and after an injury or operation can heighten the experience of pain in the brain and hinder a person’s recovery. We don’t truly know why this is the case. It is presumed to have something to do with the information your brain transmits and modulates. We know that pre-existing pain, anxiety or catastrophising a situation changes the way the brain modulates pain, with the ability to make it more or less severe. This can explain this association/risk factor. Patients, clinicians and compensation systems need to better appreciate that these psychosocial influences on recovery have a neurological basis. Importantly, recent small clinical trials are demonstrating that if we educate patients on the nerve physiology of pain, reduce anxiety and teach techniques to calm the brain and its interpretations, we can lessen pain and improve recovery. Ours and our patients' focus in hospital is the repair and recovery of damaged tissues, with surgery and medications. However, during rehabilitation a person’s thoughts and emotions are important in limiting pain. It is at this time that the practicalities of care and support systems can wane. Patients are transferred to various care providers and issues with compensation systems can develop. How a patient responds to this journey is as important, if not more so, than the injury itself. If a person hasn’t returned to work 12 months after their accident, they become more unlikely to do so. Many patients report that after this time it becomes difficult to access care and support from compensation systems. As for Michael, four months following injury, he continues to worry about the physical recovery of bones, muscle and skin, but has good (but not complete) pain control and a pragmatic approach towards maintaining his role in the family business. His son has assumed a leadership position, while Michael traverses the maze of health care and compensation claims, knowing that recovery is likely a year away and even then will not be complete.